1. 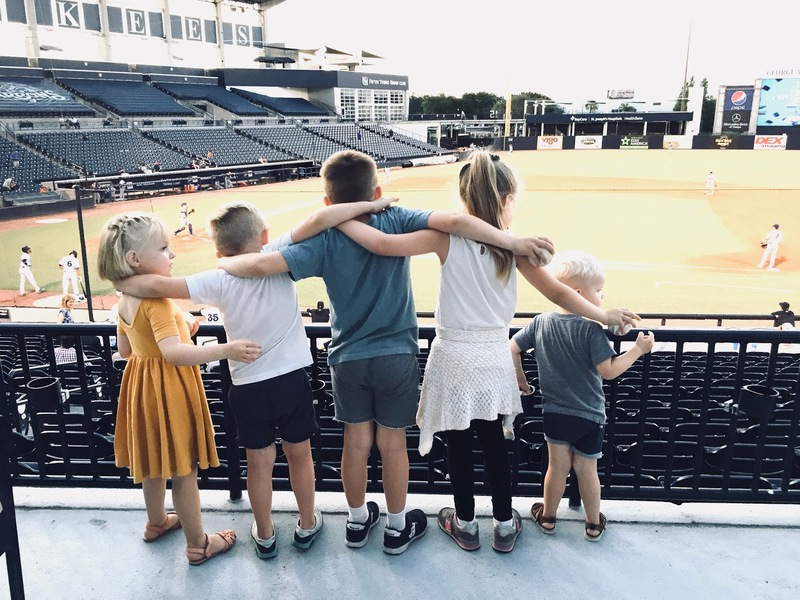 Simon took the five oldest to a Tampa Tarpons game this past week. They had a blast and I'm not sure even I would've taken them solo so let's hear it for Simon. Bosco carefully packed the five baseballs they got at the game in a shoebox and dutifully placed it right in the middle of one of our mostly empty moving pods this afternoon. Priorities Patton at your service. Simon also managed to snap this super candid pic. Please note Julia's cardigan she insisted on wearing in 98% humidity. We told her there was no way she'd need a sweater and she said she was just keeping it around her waist because, "that's the style." 2. ANYWAY, skip the remainder of this post and go read Fran's birth story because you know I've read a lot of birth stories and this one - it's PLATINUM STATUS. Go! 3. I got so many kind emails regarding my melanoma excision and am happy to report that the margins were clear!! So, no follow up treatment is necessary and now I'll just be bathing in sunscreen and doing + scheduling skin checks like a skin check fiend and counting my blessings. I got the stitches out and it looks a million times better already. I've never been a neckerchief gal but I'm going to have to hop on that train asap. If you're worried about a weird looking freckle or mole - the only thing that tipped Simon off about mine was that it went from a teeny tiny raised mole to suddenly being completely flat with one jagged edge. So, there was a huge red flag in the appearance change which turned out to be a good catch on Simon's part. I look in the mirror all the time and didn't even notice the change so shoutout to Dr. Patton. And thus concludes neckgate! Thankfully! 4. Moving right along to #bachelorettenation. I'm firmly planting myself on Team Blake and there's not much any of the other guys can do to sway me at this point. I'm SO EXCITED that Ashley is back to recapping because she has a gift for the written Bachelor/ette word. 6. I've seen these pants on a few of my favorite bloggers these pants and almost broken the, "thou shalt not covet thy neighbors perfect cropped pants" commandment. Almost! Not quite. 7. I've had my eye on this rug for quite some time and haven't seen it priced this low ... ever. Now the conundrum is do I risk waiting until we move and hope the price doesn't go back up or order it and move it? I'll probably go with the former since I'm nothing if not a risk taker of the most wild variety. Time to make it e-official (efficial?) and tell you fine folks that we are loading up and moving back up to Kansas in a few weeks!! When we left Wichita two years into our marriage for Simon to start his residency we were so sad to leave Simon's family and the wonderful community behind. So! It's been fun envisioning life with a few more kids in tow back in the neighborhood close to Simon's dad, his sisters and their families, Simon's grandma and cousins GALORE. I'm even working on some of my family to throw on their ruby reds and join the fun so we'll see! I'm hopeful! The kids are ecstatic and we're excited to be in such close proximity to SO MUCH family once again. I would be remiss in not saying how bittersweet it is to leave our wonderful friends here in Tampa. We've met some wonderful people who feel like family and will be hard to say goodbye to but I have a sneaking suspicion they'll be itching to get up to the likes of Wichita sooner rather than later. Maybe in mid-February? Sarcastic font - where you at. I'm so proud of Simon for finishing his fellowship (ahem - in a few weeks but close enough!) and am excited for him to start doing what he's been training the past seven or could we count med school and say eleven? years to do. He's going to want me to delete this paragraph but here it stays because he's a rockstar in the most figurative sense of the word. The above photo was taken not quite nine years ago after we'd packed up our respective and tiny apartments in Kansas City and were headed to Wichita shortly before we got married. We really committed with the digital camera in the grass + self timer trick. You're welcome - future blogger Grace. It's not. Not yet! You won't get rid of me that easily, dear readers. So cheers to the next chapter. Have a drink or three "with" us tonight! 1. Hellllllo June. This week was a doozy and I wouldn't use the word doozy if I didn't really mean it. 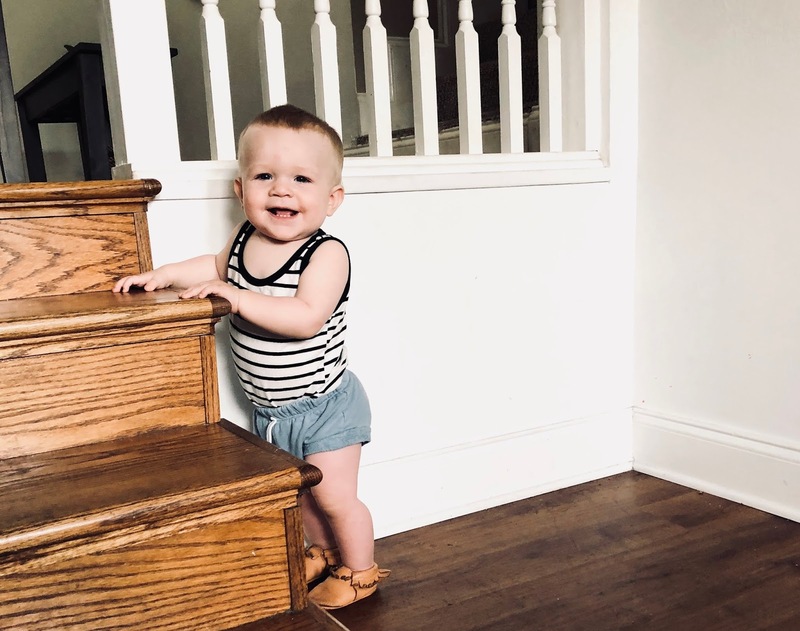 This was the first official week of having everyone home for summer and I need to step up my summertime game or just embrace the blessed chaos or maybe a healthy marriage of both. We do start a smattering of activities next week which will add some needed structure and routine ahem so I tell myself. Anyway, the week ended with a bang. 2. Let's stretch this into two takes. The bang being what I thought was going to be a simple excision of melanoma on my neck (rightright above my thyroidectomy scar - cancer likes the front middle of my neck, what can I say?) that would maybe result on a stitch or TWO but ended up being 17 stitches and a z-shaped scar that scared the living daylights out of the kids (beyond understandable). I'll spare you a photo but hopefully it'll heal quickly and I'll feel a little more willing to share (although not sure anyone cares) (how many parenthetical statements can I fit in here?) (too many). The unexpected pain has temporarily taken the wind out of my sails and the sight of the not small z was pretty jarring, to be honest but putting vanity aside I'm so glad we (Simon spotted it) caught it when it was still stage 0. Anyway, douse thyselves in sunscreen! Get your skin checked! Make your kids wear swim shirts even when none of the other kids rocking them! And hats! You get the picture. End PSA. 3. So if you see me rocking a short sleeve turtleneck or ten even in the blazing summer temps - you'll know why. And you'll pass slightly lesser judgement. I hope. 4. Anyway, if you have any really great movie or good shows to binge (although Simon and I have been "binging" Suits for months and are just about to start season 4 ... ) I'm ALL hungry eyes. 5. I'm currently reading TWO books because I was so excited that they both came off the hold list at the same time and they're both very different. The Little Bookshop on the Seine and The Lying Game - so far so great on both fronts but I'll give my final verdicts next week. Bait that breath! 6. BacheloretteNation! I was kind of disappointed for Becca on the guy front but my frontrunner status goes to Blake. I talked alllll about it on Mary's podcast right on over HERE. 7. Two things jumped out to me on the retail front this week and that was these shoes and this sweet top. Will I ever quit peplum + embroidery? Eventually. Probably. Maybe. Yes, of course - I've got turtlenecks to collect.